So what is the “1689″? It’s a short summary of Bible teaching. 32 chapters or 42 pages in my pocket edition. Who wrote it, why, when? Of all heretics and schismatics, the Anabaptists ought to be most carefully looked unto and severely punished, if not utterly exterminated and banished out of the Church and kingdom.. They flock in great multitudes to their Jordans, and both sexes enter into the river, and are dipped after their manner with a kind of spell, containing the heads of their erroneous tenets… And as they defile our rivers with their impure washings, and our pulpits with their false prophecies and fanatical enthusiasms, so the presses sweat and groan under the load of their blasphemies.. It was in response to attacks like this that a group of Calvinistic Baptist churches in London published in 1644 a summary of the doctrines they taught. They wanted to show that, though they viewed baptism differently from the mainstream Puritans, their understanding of the doctrines of salvation and the Christian life was absolutely in line with the Protestant Reformers and the Puritans. Fifteen ministers from seven churches signed this summary which is known as the 1644 Confession of Faith or the 1st London Confession of Faith. Thirty-three years later, in 1677, a second summary was drawn up. Nobody knows for sure who drafted this document, but it had just the same goal as the 1st Confession – to show that Calvinistic Baptists were faithful to the Bible and the reformed faith. 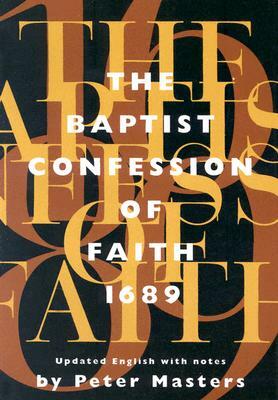 So instead of producing a completely new document, the Baptist authors based it on the great Puritan confessions of faith that already existed – the Westminster Confession (Presbyterian) and the Savoy Confession (independent). They took these documents and simply rewrote the sections dealing with baptism, the church, the Lord’s Supper etc. Anyone who read through the new Baptist confession alongside the older paedobaptist confessions, could see that in all the great doctrines of God and the gospel, they were identical. The 1677 confession was produced during a time of intense persecution and could not be circulated openly. All that changed after the Glorious Revolution of 1688 when William of Orange with his wife Mary came to the throne, and a new era of freedom dawned. Calvinistic Baptists were among the first to take advantage of the new freedom. In 1689, the pastors of London churches sent out a letter to other churches calling them to an Assembly to be held to “to consider such things that may much tend to the honour of God, and further the peace, well-being, establishment at present, as also the future comfort of the churches”. The Assembly met as planned for a week of discussions and prayer. More than one hundred Baptist churches in England and Wales sent representatives. One of the most vital decisions they took was to publish the 1677 Confession. That is why it is known as the 1689 Confession of Faith or the 2nd London Confession. Today, churches all across the world know and love that confession, drawn up more than three hundred years ago, amid the fires of persecution. Churches in North and South America, South Africa, New Zealand are glad to call themselves “1689 churches”. I know of churches in Fiji, Yugoslavia, Madagascar, Poland, Malta which hold to the 1689 Confession. When we agreed that as a church we would uphold the 1689, we were associating ourselves with other churches across the centuries and across the world. The 1689 is a wonderful summary of Christian doctrine. Of course the English in which it was written now sounds old-fashioned and can be hard to understand. But it’s been rewritten in modern English (A Faith to Confess: The Baptist Confession of Faith of 1689, rewritten in Modern English; Carey Publications; 1975 and many editions since). Like any human document it isn’t perfect. There are places where I would want to tighten up the language to bring it closer to the exact wording of Scripture. For example, in chapter 6, the Confession tells us that Adam and Eve were “the root..and standing in the room and stead of all mankind” so that “the guilt of the sin was imputed…to all their posterity”. It would be more biblical to say that Adam alone stood in the place of mankind and the guilt of his sin was imputed to all his descendants. In chapter 26, the Pope is called “the Antichrist”. I think it would be better to say “an Antichrist”. There are perhaps half a dozen places where I would want to rephrase the Confession. But these are minor blemishes. Overall, the Confession is a wonderfully clear, systematic, succinct, moving summary of Christian faith. And it’s so contemporary. Although it was written so long ago, very often you’ll find it deals so helpfully with the most up to date issues. How about this as a response to the claims of charismatic prophets and tongue-speakers? “..the merciful Lord from time to time and in a variety of ways has revealed Himself, and made known His will to His church… He caused this revelation of Himself and his will to be written down in all its fullness. And as the manner in which God formerly revealed His will has long ceased, the Holy Scripture becomes absolutely essential to men… The sum total of God’s revelation concerning all things essential to his own glory, and to the salvation and faith and life of men, is either explicitly set down or implicitly contained in the Holy Scripture. Nothing, whether a supposed revelation of the Spirit, or man’s traditions, is ever to be added to Scripture”. We don’t suggest that every Christian should be able to agree to every statement in the Confession in order to join this church. We wouldn’t expect very young believers, just converted, to have digested all the meaty doctrines it contains. But we do hope that as the years go by, members of the church will spend time getting to know the Confession, studying it, chapter at a time, perhaps memorising sections which they find especially helpful. We want children and young people growing up in the church to be familiar with its teaching. One of the reasons the churches that met in 1689 agreed to publish the Confession, was that they hoped families would use it to teach the young. “May not the gross ignorance and instability of many… be justly charged upon their parents and masters, who have not trained them up in the way wherein they ought to walk..”. B. B. Warfield, the great evangelical theologian of the 19th century, believed that the great creeds and confessions “have in them more food for your spiritual life – are more directly, richly, and evangelically devotional – than any other book, apart from the Bible, in existence”. I think he was right. And I think the 1689 is one of the richest of them all. Any Christian who reads and studies it will find his faith strengthened and his understanding sharpened. It’s a treasure. If you don’t have a copy, order one. Or ask me to order one for you. Or download one from the internet. And then don’t leave it to gather dust. It’s too rich a treasure to be left forgotten on your bookshelves. It’s our confession. Make it your own.